In the Programmatic Buying and Marketing Automation spaces AMPED is developing, or we are seeing the development of, new capabilities that are redefining what ABM looks like and who can benefit from it. It's probable as a B2B marketer that there are brand new ABM strategies that you can leverage today to grow your business. First, we'd like you to rethink what ABM is. We want you to stop thinking of ABM as selecting a small number of accounts to prospect. Instead, begin to think about a set of accounts of any size that share some common attributes. Small businesses that are resellers, distributors or channel partners that are using one of a handful of Marketing, CRM or Account Management technologies. Businesses like Auto Dealerships fit this mold as do Managed Service Providers and Marketing Automation Resellers. eCommerce companies that are using a specific ecommerce platform. Companies with very specific definable attributes such as Vertical and Size, but also may have any number of other attributes such as a large number of potential locations to reach, certain types of IT Security needs or be running on a specific Cloud Platform. A well defined sub market such as Universities and Colleges, Military Bases or Hospitals. If your solutions fall within any of these categories, we encourage you to read on! ABM, or Account Based Marketing is a topic that has been gaining interest recently in B2B circles. As a B2B marketer, we encourage you to review the resources we’ve assembled for you below. Of the wide array of content we’ve absorbed on this topic, we believe that this is the best and most useful for you to get up to speed on ABM. The recent Zoominfo Growth Acceleration Summit in Boston was well attended by B2B marketers looking to hone their ABM chops. Zoominfo is introducing some interesting ABM solutions in their own right and we encourage you to take a look here. The Marketo Marketing Nation eTradeshow had some excellent presentations that will help you to further understand ABM and where Marketo sees their platform evolving to accelerate and measure your ABM efforts. Pure Inbound Marketing takes time and can limit the discoverability of your brand to the search box. Leveraging Content Amplification strategies can significantly improve TTV (Time to Value) of Inbound Marketing and several Content Amplification techniques can also drive your ABM results. The simplest form of ABM Display Targeting is IP targeting. Imagine surrounding a building or set of buildings with Display Ads and you can start to imagine how IP Targeting works. In this model, you obtain (or we provide) IPV4 ranges for a specific customer (or potential customer) as well as relevant building addresses. To get a sense of how this works technically, google ‘what is my IP’ and you can find out your current IP address. 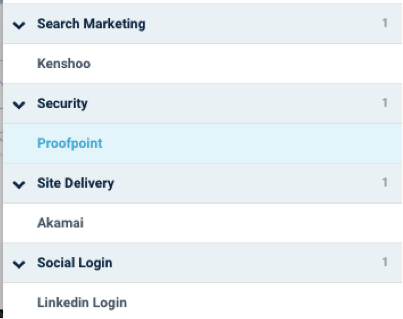 Knowing this address, we can present display ads to you or any device coming from (connected to) this network across an enormous range of publisher websites. Using 3rd Party Data we can also narrow the display targeting to those individuals most likely to be part of the buying team within that organization. While IP Targeting uses a specific type of 3rd Party Data, CRM targeting uses 1st Party (your) Data. Using your CRM data, we are able to take a set of email addresses that you provide and associate them with a related cookie set. This cookie set is then targetable like you would target any 3rd Party Data Set. The match rate is not 100% but it can be very high. This means that you can reach (anonymized) sets of specific individuals across the web with your content or content offers in parallel to your email campaigns. What is your average email open rate? What percentage of your email list are not seeing the learning opportunities that you are providing? Some people turn email off, sometimes a subject header doesn't resonate. With CRM targeting (most of) your email list will also be presented your content via display, radically improving the value of your content, and your CRM email data. Want to understand more fully 1st and 3rd Party Data and how B2B Marketers can leverage them? We recommend that you download the Introductory Guide to 1st and 3rd Party Data for B2B Marketers so that you can use them to your advantage. This is an exciting new development that AMPED is bringing to market. By bringing two of our technology partners together, we are able to target accounts that are using specific types of hardware or software as long as these are 'visible' under their website. We call this Technographic Targeting. 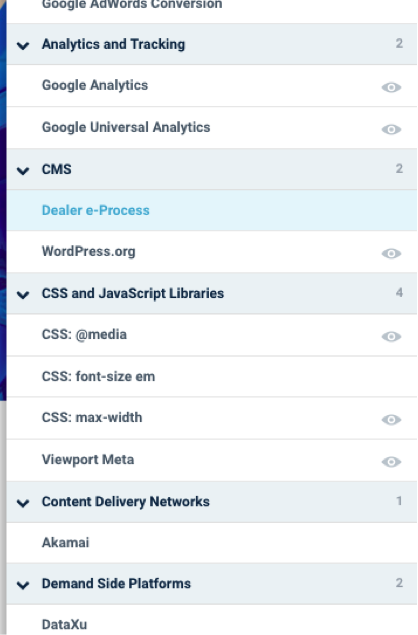 To get an idea of how this works, you can use a number of technologies to see what is 'running under the hood' of any website that you visit. One commonly used tool is ghostery. Any of the attributes that are visible such as those as shown in the examples below are targetable across any other website in the world with the same attribute. 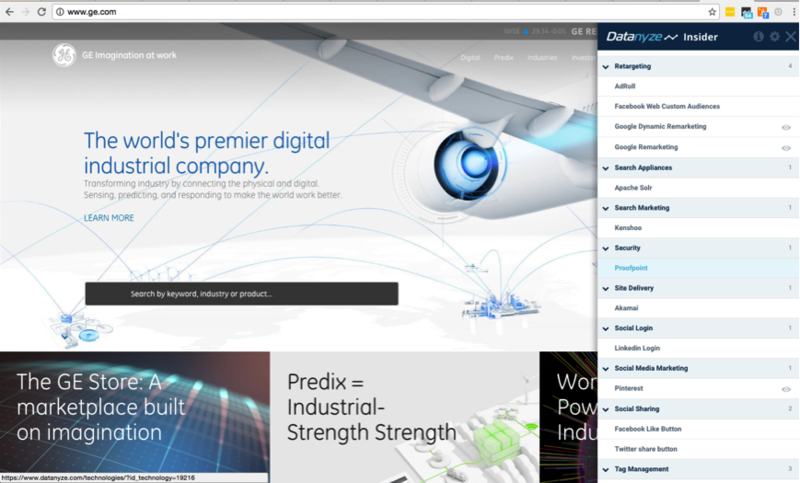 www.ge.com uses ProofPoint as a security application. 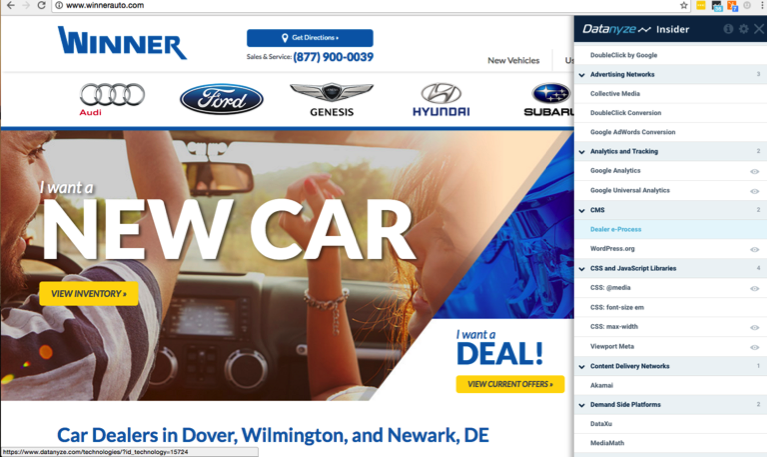 www.winnerauto.com uses Dealer e-Process as part of their CRM solution. You can layer 3rd Party Data targeting over your Technographic Targeting to further segment your audiences and minimize your spend while improving engagement metrics. New digital marketing technologies enable you to Amplify your content in selective ways not available even a few months ago. You can accelerate the penetration of your sales team into a wide range of highly selective accounts. In large part this is due to the evolution of 1st and 3rd Party Data targeting. We highly encourage you to take advantage of the resources above and of our Introductory Guide to 1st and 3rd Party Data for B2B Marketers. PreviousHubSpot Free CRM vs. SaleForce CRM NextTo Jargon or Not to Jargon?